I really enjoyed the creativity of this book! The monsters were praised for the more disgusting and unattractive things they could do. This would be a cute book to read to a young class as Mother's Day is approaching. I really think that students in elementary grades would enjoy this book because it is silly and not typical. It talks a little about gross things such as hairballs and slime, which some young kids find really funny to read about in a book. In this story, a mama monster goes through and tells all of her little monsters why she thinks they are special, and in the middle of the night they all make her a special surprise to wake up to the next morning. It is a heart-warming book which is interesting becuase it talks about things that are not heart-warming, and are even a little gross (think tar pits and stinkweed). I found this book fun and sweet, and would put it in my classroom someday. This book about a mommy monster who loves all of her children. As she puts them to bed, they all ask the same question; "Who do you love most, mama?" Of course mama loves all of her monsters so she tells them that they are special monsters in their own ways. Ones creative, ones funny, ones brave, and ones polite. 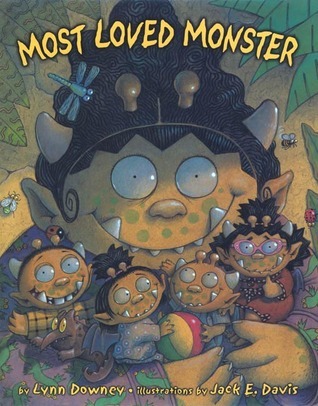 When Mama goes to sleep, her four little monsters use their own special characteristics to do something special for mama.I would use this book to teach children about text to illustration connection. All of the images do not work to comprehend all of the text, but most of the pictures can be used parallel to the text. Students can consider this book for illustration help as they are creating their own pieces of literature with illustrations to match. Media: Colored Pencil, acrylic, dye, and inkThis book was very cute. It starts off with the monster mom reading a bedtime story to her kids. Each little monster asked who she loved most. To each little monster she replied with a compliment on how each one was special. And each little monster loved her the most. Loved the pictures more than the story. Each little monster want's mommy to say she love him or her best. Instead the mother tells them about their best qualities which in turn causes them to live up those qualities. Felt a bit saccharine. The mommy monster tells each little monster when tucking them into bed why she loves them. Then in the middle of the night the 3 little monster children decorate the house and make a cake to surprise their mom that they love most. Mama Monster tucks her baby monsters into bed at night and tells them why each one is her special little beast. In the middle of the night, they sneak out and plant a surprise for Mama. Both cute and gross! A great book for multi-child families that asks the question: who does Mommy like best? Boys will enjoy the gross slimeyness of the story. Downey's a bit longwinded, so the real young readers probably couldn't handle the story. A great read for kindergarten classes up through second grade. Even hideous beasts can love And be loved. Unconditional Affection and relativityAt its finest. a little bit too over the top sweet for me. Not our style of story! monster (as in roar, not bratty) children each want to know why mama loves them different from their siblings. results in each child showing their love in their special way for mama. Gross in a cute way. This book has lots of good pictures, my son loves it. This book had a good story line, but it was ok. I would recommend this book for ages 2-8. Clever and fun, and the illustrations were great. Extra hook that it is somewhat a Mother's Day book. A book both darling and disgusting. Truly a delight for momma and baby monsters alike.